In yesterday’s post, I shared a small review of Five Years in Heaven: The Unlikely Friendship that Answered Life’s Greatest Questions and the Video Hangout conversation about Five Years I had with author John Schlimm. Today I’m excited to join with Image Catholic Books in offering one GiveAway of John Schlimm’s Five Years in Heaven! There are many ways to enter but only one of the options below is necessary for a chance to win your own. I also mentioned John’s #ThankANun campaign going on as a way to encourage others to think of how a “Nun” has been a positive influence in their own lives and take the time to thank them (even if only through our prayers.) 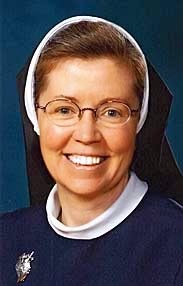 Now, when people say “Nun”, they are usually referring to a “Religious Sister”, unless they are cloistered and then it would be more appropriate to say “Nun.” Just saying. Like John, I was blessed to attend a high school where “Nuns” taught. At the time, their convent was on the high school campus, their apostolate was literally a walk across the parking lot. I came to love all the Sisters of the Immaculate Heart of Mary dearly – well maybe almost all of them ;). I loved their sincerity and kind hearts, I admired their attention to detail and their patience – it couldn’t have been easy working with a bunch of high schoolers with raging hormones and burning passions for life. Those Sisters were a subtle – yet pivotal – part of my high school years. Through their silent but steady example, I grew to desire what they had. I wanted their Faith and loyalty to Christ. I even went on a Discernment Retreat and spent many hours talking with them through the years. Turns out, through all those times, God was actually using those moments to show me how beautiful the Sacrament of Matrimony is. But that’s a story for another day perhaps. I remember the soft-spoken voice of Sr. Mary Ann as she brought us deeper into an understanding and appreciation for the Catechism of the Catholic Church. I admired Sr. Veronica Marie’s outward patience as she tried to get a bunch of sophomores excited about the deep symbolic truths hidden inside the Liturgy of the Catholic Mass even though her monotone voice was more like a sweet nap-time lullaby. It was the time she gave to her students outside of class that I remember the most. She was there for whoever needed it, to listen, kindly offer a few words of advice, but mostly to just listen. And Pray. 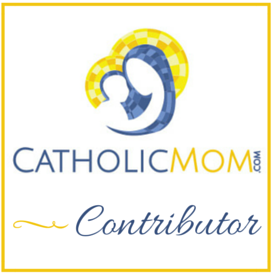 All those Sisters were – and still are – so good at prayerful listening. A skill I’m still working at refining. But, out of all the Sisters who taught me and formed me during those High School Years, the two that will forever stand out in my memory are Sr. Mary Magdalene and Sr. Giovanni. I met Sr. Giovanni my freshman year. I had heard “horror” stories of her from my older brother but my mother insisted she wasn’t all that bad. When I met her, she looked like she was a thousand years old…but she had a certain zeal about her and a hint of mischief. I was never quite sure how to read her. If I thought she smiled at me, I’d smile back, which only brought on a death stare that tore a hole clear through my eyes out the back of my head. She was incredibly particular about where exactly we were to write our name on the right side of the blue line going down the college-ruled notebook paper. One time, I think I got a slight crease in one of my assignments and I asked my mom to help me iron it for fear I’d get marked down for the slightest wrinkle. The worst thing that could happen is that she’d call me up in front of the whole class and ask me about the wrinkle. During class-time passing periods, she would get out her cane and hobble through the flood of students hurriedly trying to navigate the over-crowded hallways to get to their lockers and next class in 4.59 minutes. She’d look you right in the eye and point her finger at you and think for a moment. You had to be perfectly still while she decided whether to call you an “Angel” or…scowl at you and dub you a “Not so Angel”…or worse Mud Plus. Don’t even ask about Double Mud Plus. Sr. Mary Magdalene. Just look at her face and tell me how you couldn’t love her? 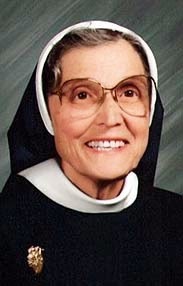 Sr. Mary Magdalene – now actually Mother Superior Mary Magdalene, was kindly referred to as “Turbo Nun”. For that she was indeed. She was – and still is – full of energy and motion all.the.time. Even when she was irritated with us, she would find a way to smile…even if through clenched teeth. She had a way of getting down on our level and tried to reach us silly sophomores, who thought we knew everything, and meet us where we were. Although she never went into to many details, there were hints that alluded to a not-so-holy past. I think this is what helped her understand us and what helped us relate to her. Sr. seemed to have only eyes of Faith when she looked at all of us. She always tried to give us the benefit of the doubt. I think there were many who tried to take advantage of that. But if this bothered Sr., she never showed it. I think Sr. truly desired for all of us to share that same excitement and love for Christ and His Church that bubbled up inside her. Her joy was contagious, I wanted what she had. Sr. Mary Magdalene, thank you. Thank you for sharing your energetic zeal and passion for Christ and the Church. You never gave up on any of us, even if we’d given up on ourselves. You were – and are still – like our Spiritual Cheerleader, constantly cheering us on and encouraging us to keep going, keep searching, keep turning to God to fill that “God-shaped hole in all our hearts”. I have many precious memories of the Sisters of the Immaculate Heart of Mary. I’m truly thankful for their presence in my life and high school years. As an adult, when I run into them at various events in the Diocese or at their Mother House, my heart fills with Joy and Gratitude for all the love they’ve poured out to all of us over all these years through their prayers and presence in our community. Do you have any special memories with a “Nun”? Take time to Thank God for them today – and if you can, send them a little card of thanksgiving.